It was my birthday a couple of weeks ago and my parents gave me a copy of the new revised English edition of that Bible of Afrikaans cooking, Cook and Enjoy. It’s testimony to the ubiquity of the book that I find myself referring to it by its Afrikaans title Kook en Geniet, rather than its English name. Kook en Geniet is the Afrikaans Mrs Beeton’s Book of Household Management. Published as a guide to housekeeping and cooking for young brides in 1951 by Ina de Villiers, a Stellenbosch-based home economist, it has never been out of print. There are very few Afrikaans households which do not possess at least one copy of the book – and, like Mrs Beeton, its success lies partly in the fact that it is regularly updated. De Villiers herself was responsible for testing and re-testing recipes, and for producing new editions of Kook en Geniet. 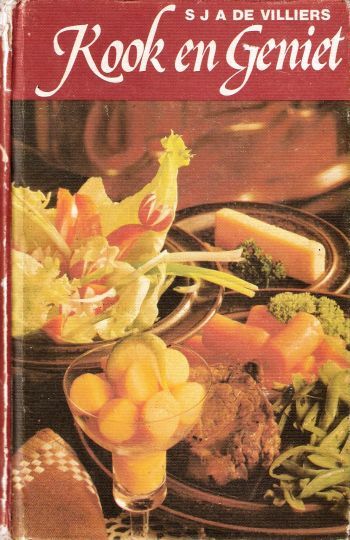 Her long-standing association with the book helped Kook en Geniet to gain its reputation for being a fail-proof authority on Afrikaans cooking. Since her death in 2010, her daughter, Eunice van der Berg, who also happens to be a home economist, has taken over responsibility for it. As the microwave oven and food processor have become nearly indispensable in many kitchens today, their use is indicated in a number of recipes. However, experienced cooks will be able to use these timesavers for almost any recipe – it is left to their discretion. My edition contains recipes for moussaka and lasagne. But it’s not for these that I use Kook en Geniet: it’s for staples of Afrikaans cuisine, like buttermilk rusks, Hertzoggies, quince chutney, vinegar pudding, and prickly pear jam. It’s a supremely practical recipe book. Helping out at the pancake stall which seems to accompany every major event – from agricultural shows to local government elections – in small town life? There’s a recipe to make enough batter for a hundred pancakes. Need to make bobotie for fifty at the church fete? Serving sosaties to eighty people at a barbeque? Kook en Geniet will come to the rescue with sensible, authoritative advice. For anthropologists and historians interested in food, the value of Kook en Geniet lies in the fact that it changed as tastes evolved. It does not present readers with a static, inflexible view of ‘Afrikaner cuisine’. It acknowledges – tacitly – that cooking alters over time. It’s not, though, the only source on what I’ve called Afrikaans or Afrikaner cuisine – more frequently referred to as boerekos, which translates literally as ‘farmers’ food’, but signifies considerably more than that. Boerekos is the homely, comfort cooking associated particularly with rural Afrikaans living. A wildly popular new series on the Afrikaans cable channel Kyknet, titled simply Boerekos, interviews a collection of Afrikaans women cooking their favourite, old-fashioned boerekos, from mosbolletjies to pie. Programmes like this one, as well as other books on boerekos, seek to frame it as an unchanging cuisine: as a form of cooking which has remained reassuringly the same during a century of tumultuous change. For Afrikaner nationalists before and during apartheid, food was a useful way of forging a new, unified and distinct Afrikaner identity. As they codified and regularised Afrikaans, so they sought to create a unique Afrikaner cuisine. C. Louis Leipoldt, culture broker, poet, journalist, doctor, Buddhist, and eugenicist, filled several journals with recipes he collected from friends, acquaintances, and people whom he came across while working during the 1920s and 1930s. (These are now held by the National Library in Cape Town.) He wrote about these recipes and rural cooking for Die Huisgenoot, a popular magazine with a distinct enthusiasm for nationalism, between 1942 and 1947. In 1933, at the height of the Afrikaner nationalist revival, he published Kos vie die Kenner (Food for the Expert), a collection of a more than a thousand recipes. Polfyntjies vir die Proe, Three Hundred Years of Cape Wine, and Leipoldt’s Cape Cookery appeared posthumously. One of the ironies of boerekos is that so much of it is derived from the cooking of the slaves who were transported to the Cape from southeast Asia during the seventeenth, eighteenth, and early nineteenth centuries. The sambals, atchars, and chutneys of Afrikaner cooking are a particularly obvious debt to the food traditions imported to South Africa from present-day Indonesia and Malaysia. Although Leipoldt, an unusually thoughtful nationalist, acknowledge that many of the recipes he found were cooked and invented by ‘Malay’ women – a term which he used to describe the largely Muslim and Afrikaans-speaking descendants of slaves who lived in the Cape –their presence gradually disappeared in other, later boerekos recipe books. There is no neat boundary between Afrikaner cuisine and what most South Africans dub ‘Cape Malay’ cooking: there are recipes for bredie (mutton stew), bobotie, and sosaties (kebabs) in both boerekos and Malay recipe books. But in order to use food to construct distinct, discrete national or group identities, the differences between these two cuisines had to be emphasised over their similarities. Nationalisms have long co-opted food and cooking to construct national identities. Leipoldt’s recipe books are the first in an extensive literature which seeks – both overtly and inadvertently – to construct an Afrikaner cuisine. It’s telling that the Afrikaanse Taal en Kultuur Vereeniging (Afrikaans Language and Culture Organisation), once strongly allied to the National Party but now a society which works towards the promotion of Afrikaans as a language, bestowed Ina de Villiers with its Afrikoon prize in 2010 for furthering the cause of Afrikaans. But minority groups use food and recipes in similar ways – to construct, maintain, and assert identities, often in the face of discrimination and social and political marginalisation. Cass Abrahams as well as other Cape-based women have created a rich literature on ‘Cape Malay’ cooking, often basing their writing on recipes collected from, and donated by, local women. These are as much social histories as they are cookery books. mostly passed on to me by persons ranging from ordinary housewives to the super cooks who abound in our community. This is why Indian Delights remains – as it has always been – a representation of the collective culinary knowledge of our Community. 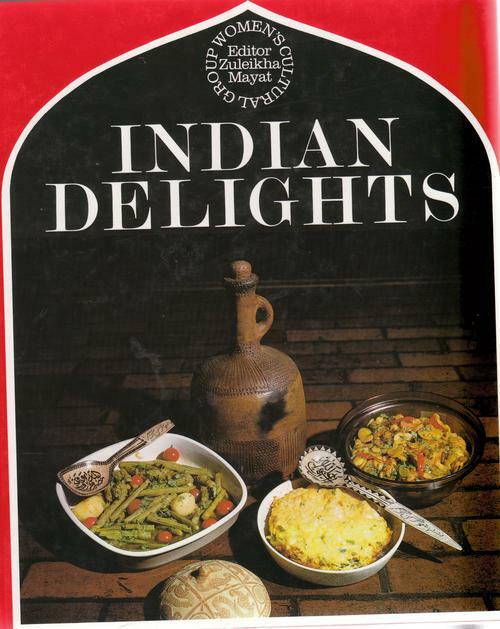 Twenty years ago when Indian Delights was first published, I had stated that the cookery book as such was something foreign to Indian women; that each dish was taught down the generations till daughters became as proficient as their mothers; but that the need of a reliable cookery book was beginning to be felt since daughters were spending more time with studies and acquiring careers. As a result of this ‘a good reliable cookery book has become essential’. It’s partly because of this extensive collection of recipe books – from Indian Delights to Kook en Geniet – that it’s particularly obvious that there is no, single homogenous South African cuisine. One of the best collections of South African recipes, African Salad demonstrates this particularly well: it’s a series of photographs and short interviews with of a more-or-less random selection of South Africans on their favourite meals. The recipes are as varied as the interviewees. I’ve been struck while watching the South African version of the MasterChef franchise by the absence of references to the African cuisines of South Africa. During one episode in which the contestants were required to barbeque, one (black) Twitter user commented jokingly that the black contestants would struggle because they would prefer over- rather than underdone meat. So far the dominant cuisine (the meta-cuisine?) of the show has been broadly western. It is this which is most closely associated with ‘fine dining’ (hateful phrase). Indeed, I was annoyed when a black contestant was criticised for cooking a steak too well: a liking for pink, lightly cooked meat is both a relatively recent phenomenon and culturally specific. Why should someone be penalised if she has cooked meat according to the dictates of another cuisine? A couple of contestants have cooked African dishes and I’ve watched those with the most curiosity: as a white South African raised in the Western Cape, I feel that I have a fairly good grasp of Afrikaans and Malay cooking, but African cuisine still eludes me. I know of certain dishes and have seen sheep heads and walkie talkies (chicken heads and feet) being sold, but this is as far as my knowledge goes. I know that there probably isn’t a single ‘African cuisine’ or African culinary tradition in South Africa – that it must differ between regions and has changed over time. 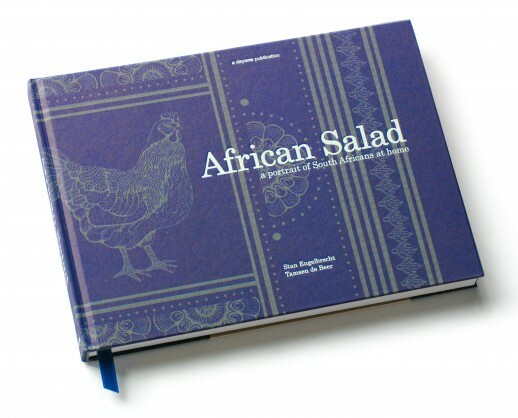 There are, to my knowledge, no substantial recipe books dedicated to this country’s African cuisines – although do please feel free to enlighten me if there are. With the current wave of enthusiasm for local producers, it’s striking that the various markets which have sprung up around South Africa have tended to model themselves on a foreign – mainly European – model. They are Borough Markets in miniature. These new ingredients – these cheeses, sausages, and free-range duck and chicken – are sold to be used in cassoulet, poule au pot, and arrosto di maiale al latte. We use local products for overseas cuisines. I’m not some mad nationalist loon who advocates that we only eat local cuisines, but as South African society changes during the early twenty-first century – as urbanisation increases and as our middle class expands – we are, as in the case of any rapidly evolving society, in danger of losing a lot of culinary knowledge. This is a pity: not only do food and cooking provide useful ways of understanding how societies function, but it also strikes me as deeply strange that the white, middle-class customers of the Neighbourgoods Market in Cape Town know more about the cooking of northern Italy than they do of the Eastern Cape. Or Langa, which is right next door. Another lovely blog post Sarah. Always so interesting. I guess the markets make food that meet a demand around current eating trends and what the customer base enjoys, although you do see traces of South African cuisine at these (curries, biltong, milt Tart, mielie bread, boerewors etc).These markets also tend to be quite lily white. Hi – and thanks! Glad you enjoyed it. Yes – you are entirely right. The markets are meeting demand, but I’m interested in why there hasn’t been a revival of interest in African cuisines, and I wonder to what extent these markets and, to a less extent, producers could shape such a revival? Huisgenoot Wen Respete 2 is a well-used cookbook in our family, given to my husband by his mother when he left home. He fondly remembers the series from his childhood and his family functions often feature heated debates as to which edition certain dishes were cooked from. Similarly my mother gave me a Delia Smith collection when I left home, all fondly remembered from my childhood, and when visiting her family in the UK I’ve laughed to find myself in the midst of a family squabble as to which of her cookbooks features a beloved leek tart or the ultimate coffee walnut cake. And I really enjoyed discovering, a few weeks back when I cooked tomato bredie for the first time with a friend, that she was using a family cookbook, given to her by her Mum called something like Cape Malay Cooking (edition 3) and laughed as she told me how her aunties like to disagree as to which edition was the best and where their various favourite recipes come from. I think recipe books such as these, even those which are no longer in print, will keep South African families grounded in their cultural cuisine for quite a while yet. We may enjoy the produce of the food markets (with various degrees of pretension) springing up everywhere but I think that just proves our love of food, and I think that love crosses many cultural barriers. Thank you so much for this comment! I could not agree with you more. Also, you demonstrate beautifully how recipe books are worked into family traditions, both culinary and otherwise. When eating ‘African’ is no longer seen as an experience aimed particularly at tourists and when marog and madumbi are on the menu as often as rocket and asparagus, that will be splendid indeed. My pleasure – and that, precisely, is the point. Very well put.